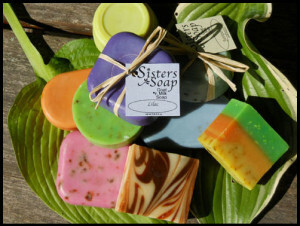 Sisters Soap began as a joint venture between sisters Caitlin Hunter (Appleton Creamery), and Megan Owen. While Cait makes the fabulous cheeses, Megan makes the wonderous soaps. Just as Cait’s cheeses please your palate and leave you craving more, Sisters Soaps will delight your senses and leave your skin feeling moisturized and pampered. We strive to make our soaps visually pleasing as well as nutrient-rich. We add dried flowers, herbs and various scents to make each bar appealing and unique. Exfoliants are sometimes added to gently scrub your skin. 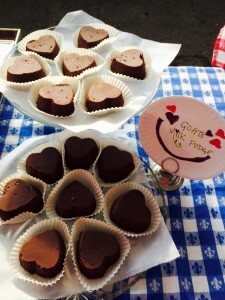 Fiona’s fabulous chocolate goat’s milk fudge was introduced at Farmers’ Market when Fiona was a little girl. Using a tried-and-true family recipe (and Mom’s help), Fiona sold her individually wrapped pieces.. She designed her own label and a banner. The first summer she earned enough to buy her own bike and start a savings account…! These days, Fiona is a grown-up, living far away from the farm. Occasionally, those of us at the farm make the fudge for old time’s sake, but it’s no longer a regular offering.